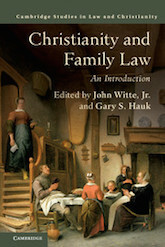 John Witte, Jr. and Gary Hauk have edited a volume on Christianity's decisive influence on Western family law over two millennia. In Family Law and Christianity: an Introduction, 25 essays tell a complex story of church-state relations in Western societies through figures such as Emperor Constantine, Theodore Balsamon, St. Thomas Aquinas, and Pope John Paul II, "whose contributions were both distinct and enduring," the authors write. Among the scholars contributing are Judith Evans Grubbs, Betty Gage Holland Professor of Roman History at Emory University; Steven Ozment, McLean Professor of Ancient and Modern History at Harvard University; and Russell Hittinger, Warren Professor of Catholic Studies at the University of Tulsa. Witte co-authors two essays, and Hauk, Emory University historian, senior adviser to the president of Emory University, and CSLR senior editorial consultant, writes about Jesus and St. Paul. The book is the latest in Cambridge University Press's Law and Christianity series, which Witte edits.